Comfort is nice. Nearly everyone wears comfortable shoes these days with lovely arch supports; we eat regularly to avoid feeling hungry; we avoid being too hot or too cold. These, among many other things in our modern world, make life comfortable. But while we all like being comfortable, very few realize that it comes at a cost. Comfort is fragilizing. Now, there is a word you probably haven’t heard before: It is based on a term coined by Nassim Taleb, “antifragile”!1 Let me explain, and let me show you how your yoga practice might be making you fragile—and then how to ensure that you become antifragile! The health of our tissues lies across a spectrum—fragile at one end, robust in the middle, and antifragile at the other end. These are shown in figures 1 to 3 where you will see health along the vertical axis and stress along the horizontal. We all know fragile: It means flimsy, frail, easily broken, or damaged. A china teacup is fragile: Drop it and it shatters. 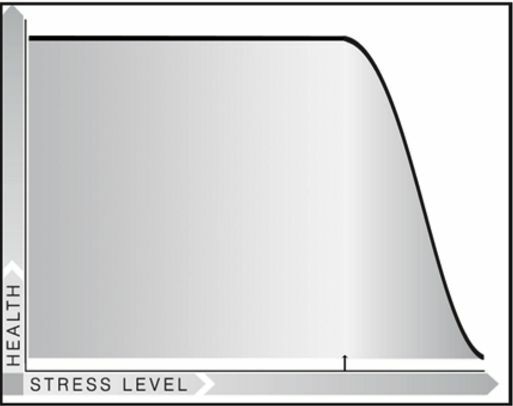 This is shown in figure 1 by that big cliff close to the origin of the axis, which means it takes very little effort to destroy a fragile object. Robust means strong, healthy, and hardy: It is very hard to destroy something that is robust. A metal cup is robust: Drop it and it merely bounces. Figure 2 shows how it takes a lot of stress before a robust object degenerates. But robust is not the opposite of fragile. Antifragile is its opposite. Figure 1 Fragile—Even a little bit of stress can shatter a fragile object. 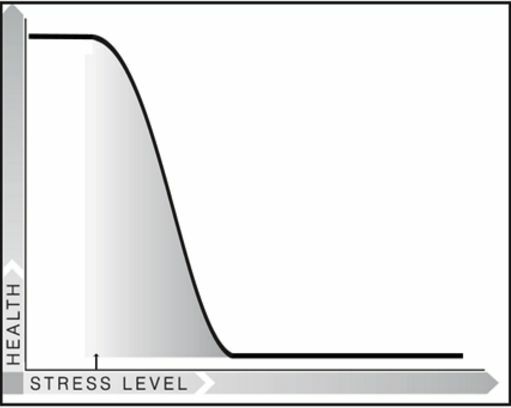 Figure 2 Robust—Health is unaffected by any level of stress (to a limit). Figure 3 Antifragile—No stress is unhealthy; too much stress is unhealthy; but the right amount of stress is great. An object or machine, like a rock or a shovel, can be said to be robust: It can take all sorts of stress, to a very high limit, and remain unaffected. A living organism, on the other hand, is antifragile: Stress, to a certain limit, will improve its health. Stress is often considered to be bad: But it is not bad, per se. It depends upon the amount and the context. ‌• We wear orthotics in the form of arch supports in our shoes. This means that the ligaments, fascia, and bones of our feet no longer receive the stress that each step normally places upon the arches. And this means that those tissues atrophy: They become weaker; so weak, in fact, that most people cannot wear shoes anymore without arch supports. Their feet are too fragile: They have to keep using support. I could go on and on about how comfort is fragilizing: being always at a comfortable temperature, eating soft food, wearing reading glasses, etc. 5 but let’s look now at our yoga practice. Here is where the danger lies: Many yoga teachers and students are under the mistaken belief that the absence of stress is healthy. If someone has an injury, say they have an injured back, the logic goes that they should rest their back. “Don’t stress it. Let it heal.” But allowing no stress to a tissue will result in that tissue atrophying. Atrophy means to waste away from disuse. This happens to the bones and muscles of astronauts while in orbit: The stress from gravity has gone, and thus their tissues become measurably and functionally weaker. They atrophy. If we do this to our backs, if we apply zero stress, they too will become weaker. This creates a negative feedback loop: Inactivity weakens the tissues, which can’t tolerate much stress, so we rest them even more, making them more fragile. An important study in 1999 found that bed rest is never a good idea for any medical condition or treatment.6 So, even when injured, we still need some stress. 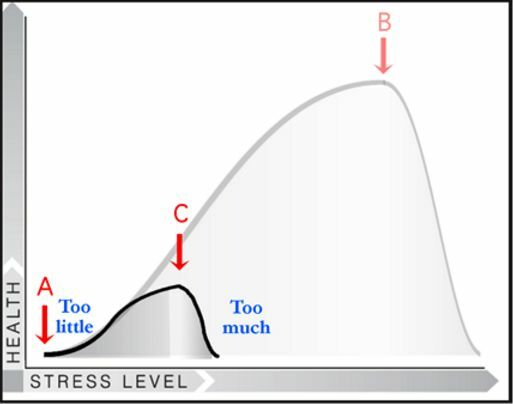 Figure 4—The antifragility curve applies even to damaged tissues, but care must be taken to not incur too much stress now. But, here’s the rub—the point of too much stress (point C in figure 3), beyond which we descend into the land of distress, is variable. It is not always the same from person to person, from day to day, or when we are injured or sick; it can actually move quite far to the left, as is shown in figure 4. Now the challenge becomes to apply some stress, but not so much that we go over the edge. The answer is, “attention.” This is the key to our yoga practice. While in our postures, we learn to sense when we are approaching the edge of our tissues’ tolerances to stress. We “play the edge,” never going past it. Ideally, we approach the edge and then back off a little. There is no need to be right at point B of figure 3: That may be too close and too risky. It is okay to back off a little, as you’ll still be in the rise of eustress. At this point, you may be a bit uncomfortable and challenged. But as soon as pain appears, you are too far—back off; stop; don’t go there! However, when we are injured in any way, we still need to play the edge. We still need some stress. Even someone with spinal osteoporosis (to take just one example) still needs to stress their spines, or their bones will continue to become weaker. These students need to develop a very fine level of awareness to know when they are getting too close to point C of figure 4. It is in these cases where, out of a fear of doing too much, we may be told to do nothing. There are yoga teachers who insist that students must never do pigeon pose, or headstand, or…pick another asana. There are teachers who claim that every time any student does a forward fold, the knees must be bent. There are myriad examples. Unfortunately, the reality is that by trying to do no harm, harm is done. Students may be prevented from getting the stress they need to be healthy, and as a result, they become fragile. The intention to do no harm is admirable, but the philosophy is flawed. Just because doing too much of something may be dangerous, the solution does not then become to do nothing. Life is not so binary. 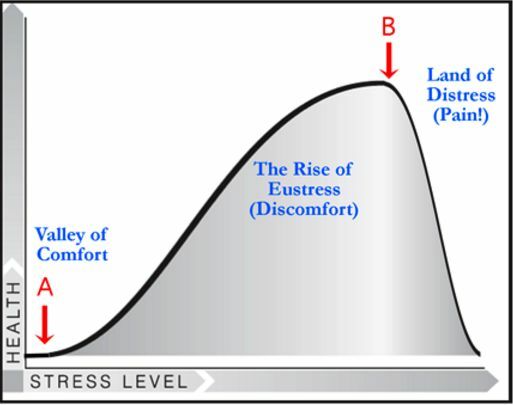 The answer is to find the place of eustress: that Goldilocks’ position where the stress is not too much, and not too little. When we do that, we are on our way to developing antifragility. 1. Nassim Nicholas Taleb, Antifragile: Things that Gain from Disorder (New York: Random House, 2012) page 58. 3. There are two common joint diseases that also explain this concept: osteoarthritis and osteoporosis. It is very rare for a person to have both conditions in the same joint because they have opposite causes. Osteoporosis can be caused by a lack of stress (point A of figure 3), and the bones atrophy. Osteoarthritis can be caused by too much stress (point B), and the joint wears out. 4. Catherine R. Marinac, Sandahl H. Nelson, Caitlin I. Breen, Sheri J. Hartman, Loki Natarajan, John P. Pierce, Shirley W. Flatt, Dorothy D. Sears, Ruth E. Patterson, “Prolonged Nightly Fasting and Breast Cancer Prognosis” in JAMA Oncology, 2016. 5. More examples of how we fragilize ourselves is found in my book Your Body, Your Yoga. 6. 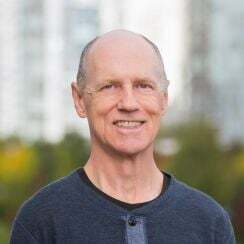 Allen C, Glasziou P, Del Mar C. “Bed rest: a potentially harmful treatment needing more careful evaluation” in Lancet, 1999 Oct 9;354(9186):1229-33.